What should have been a relaxing cruise in Karaski: What Goes Up… aboard the glorious Commonwealth’s first airship becomes something more sinister, as the craft is sabotaged! At least the suspect list is somewhat limited though, in that it has to be one of the passengers. But you’ll still have to figure out exactly who the saboteur is, hopefully stopping him / her, before anything else happens. Quite an uncanny turn of events. This particular tale won’t play out like a typical ‘detective story’ however, as here, you’re actuall the storyteller. Or rather, “your actions and dialogue define the back story as well as future outcomes”, which is kinda the same thing. Oh and everyone’s a suspect. Even… you! Muahahaha. Uncover what the passengers are hiding and write the grisly conclusion. Open-ended who-done-it mystery where others may suspect YOU if you’re not careful! So don that detective hat and get to deducing, either by chatting up the passengers, searching their belongings, something something, or, you know, just get them hammered. Completely hammered, at which point they’ll spill the beans. Or something else might happen. Nothing’s guaranteed, not even the survival of everyone aboard, what with the game’s multiple endings and all. Just saying. Karaski: What Goes Up… is available from Steam, carrying a $11.99 price tag. 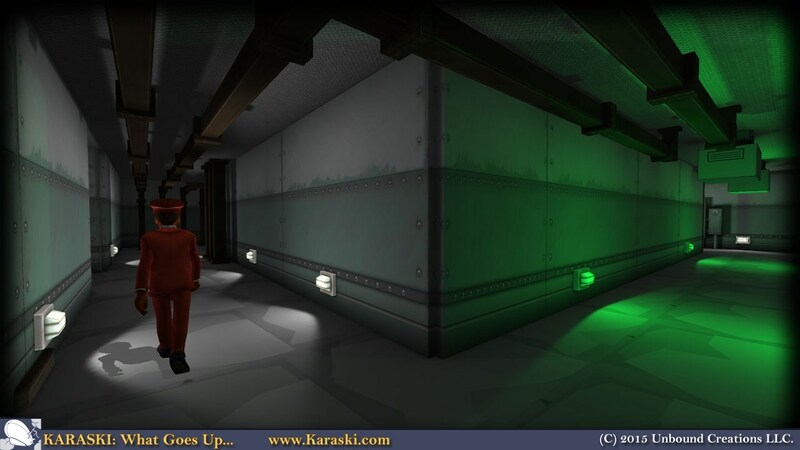 Karaski: What Goes Up… Singleplayer & open-ended mystery onboard sabotaged Slavic Airship!